It's been a busy day for Airbus regarding Vega's launch of their Sentinel-2B Earth Observation satellite. After just over one hour the solar panel, needed to supply energy, was unfolded and Sentinel-2B successfully reported in ‘for duty’, and the Sentinel-2B begins its job in conjunction with Sentinel-2A. With two satellites in orbit it will take only five days to produce an image of the entire Earth between the latitudes of 56 degrees south and 84 degrees north, thereby optimizing the global coverage zone and data transmission for numerous applications. Europe´s Copernicus program has got its second eye. On Tuesday, 7 March at 02:49 am CET (6 March at 10.49 pm local time), a Vega launcher successfully took off from the spaceport in Kourou, French Guiana, carrying the satellite developed and built under the industrial leadership of Airbus for the European Space Agency (ESA). The 1.1 ton satellite has been designed to operate for at least seven years and three months in a polar orbit at 786 kilometers above the Earth. Sentinel-2B courtesy of Airbus Defense and Space. 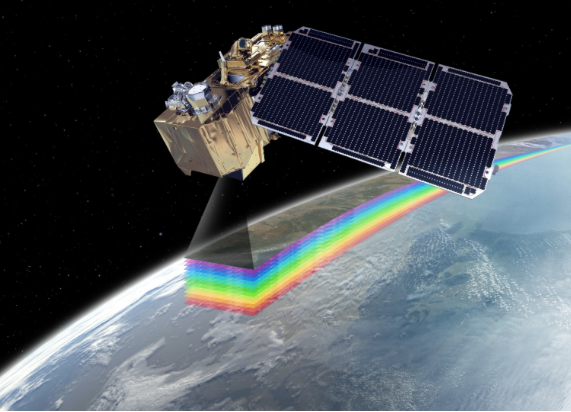 “The outstanding capabilities of Sentinel-2’s multispectral instrument and the accurate geolocation performance of the satellite along with its rapid data transmission ability fully match the rapidly rising demand of satellite-based Earth and environmental data,” said Nicolas Chamussy, Head of Space Systems at Airbus. The mission is based on a constellation of two identical satellites, Sentinel-2A and Sentinel-2B. Sentinel-2A was launched in 2015 into the same orbit, but 180 degrees apart. With two satellites in orbit it will take only five days to produce an image of the entire Earth between the latitudes of 56 degrees south and 84 degrees north, thus optimizing the global coverage zone and data transmission for numerous applications. The Sentinel-2 mission contributes to the management of food security by providing information for the agricultural sector. Sentinel-2, with its multispectral instrument, is the first optical Earth observation mission of its kind to include three bands in the ‘red edge’, which provide key information on vegetation state. Sentinel-2 is designed to provide images that can be used to distinguish between different crop types as well as data on numerous plant indices, such as leaf area index, leaf chlorophyll content and leaf water content—all of which are essential to accurately monitor plant growth. This kind of information will help informed decisions to be made—from deciding how much water or fertilizer is needed for a maximum harvest to forming strategies to address climate change. While this has obvious economic benefits, this kind of information is also important for developing countries where food security is an issue. Sentinel-2 also maps the condition and changes to land surfaces as well as monitoring forests worldwide. The mission provides information about the pollution of lakes and coastal waters, while images of floods, volcanic eruptions and landslides aid the production of disaster maps and facilitate humanitarian aid activities. The imaging instrument uses 13 spectral channels, ranging from the visible to the infrared, to deliver high-resolution multispectral images of the Earth’s surface with a resolution of up to 10 meters at an image width of 290 kilometers. This extremely large scanning width results in data coverage of the entire Earth relatively quickly, while at the same time, the advanced instrument provides an unprecedented level of detail. Sentinel-2 is also capable of using the European Data Relay System (EDRS). EDRS is a network of laser communication payloads on geostationary satellites and low Earth orbit satellites. The system, also known as the "SpaceDataHighway" is being developed by Airbus for ESA (European Space Agency) and provides secure and fast communication services. EDRS ensures the timely availability of data particularly for time-critical applications such as environmental monitoring, emergency response and security missions. Sentinel-1 and -2 satellites are the first observation satellites equipped with Airbus' laser communication terminal. EDRS-A, the first dedicated relay satellite for the SpaceDataHighway program was launched on January 30, 2016. The SpaceDataHighway has been open for traffic since November 2016. The Sentinel-2 mission has been made possible thanks to the close collaboration between ESA, the European Commission, industry, service providers and data users. Its development has involved more than 40 companies from 20 different countries, led by Airbus in Germany for the satellites and Airbus in France for the multispectral instruments, while Airbus in Spain is responsible for the mechanical satellite structure. To ensure data continuity two further optical satellites, Sentinel-2C and -2D, are being constructed in the cleanrooms of Airbus and will be ready for launch as of 2020/2021.